Since my previous post on the subject, I’ve decided that my enormous squashes are perhaps not Rogosa Violina, but in fact Piena di Napoli (which are still green on the outside when ripe). I know, I should do a better job at labeling, but sometimes labels vanish or I am convinced that I’ll remember. Anyway, it turned out that the plant had produced not two but three fantastically large squashes – one of them was completely hidden under my Malabar spinach vines, and emerged when I cleaned them up after a frost. 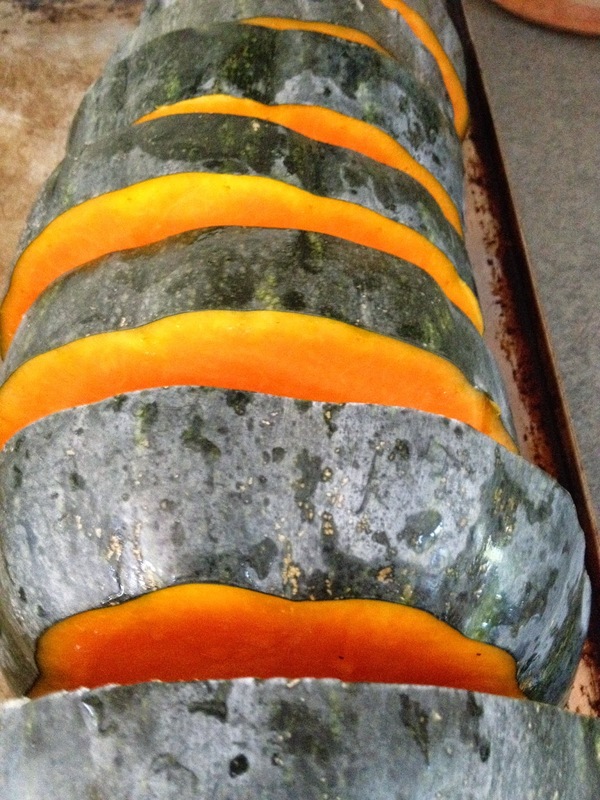 I baked another of the huge butternut-relative fruits. Interestingly, the seed and neck ends have different textures, the neck end being hard and smooth and the seed end softer, with a cooked texture almost like spaghetti squash though not forming long enough tendrils to treat as “pasta.” This squash, if I’m identifying it right, is used in pasta traditionally, and also to make jam, which I have not tried yet. I have another uncooked squash to play with still, though, and a lot of frozen cooked flesh. What I have made, besides soup: squash bread with lots of spices in it. Squash and Stilton Biscuits (warning: I found the “moist dough” warning was an understatement, and had to add lots more flour just to be able to handle the dough at all. Also, they are very rich, so make them for a crowd). And squash pizza dough (perfect for a Neapolitan squash!). I could give you a recipe (I based mine on one by Deborah Madison) but if you already make pizza dough from scratch you probably have a favorite method. Just add about 1/3 to 3/4 cup of cooked pureed squash to the dough, depending on how much the recipe makes (low end for one pizza, high end for two or more). You may need to cut back on other liquids and/or add flour. Dough should be springy and moist but not so sticky you can’t knead it. I also added some fresh marjoram that was about to freeze outside. 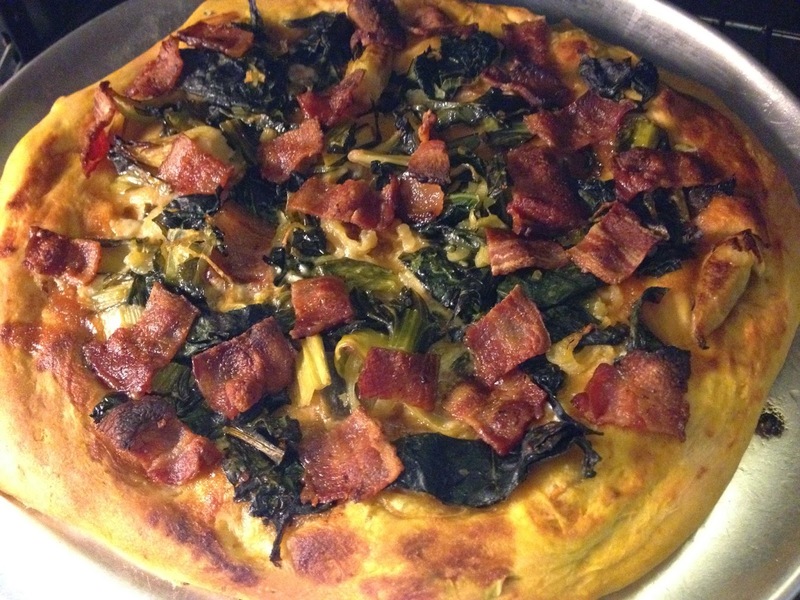 Here’s my finished pizza, topped with leftover greens (with onion), a bit of Gorgonzola cheese, and bacon. I need to learn not to put too many toppings on homemade pizza, because the center never bakes solid. Maybe pre-baking the crust briefly would help? I’ve got another batch of dough in the freezer to do something with. The logical topping for Squash Pizza 2.0 would be… squash. Amazing squash and the pizza looks delicious! I'm with you on labeling and knowing I will remember what I've planted, since I have such a great memory, not. 😉 Somehow this year we ended up with several habanero plants that I have no clue where they came from since I know I planted jalapeno seeds. Loved your post. Every year I swear I'll get better at consistent and permanent labeling, and every year some labels fade or get attached to the wrong plants or never get placed at all. Oh well! I like the sound of the squash bread with lots of spices. 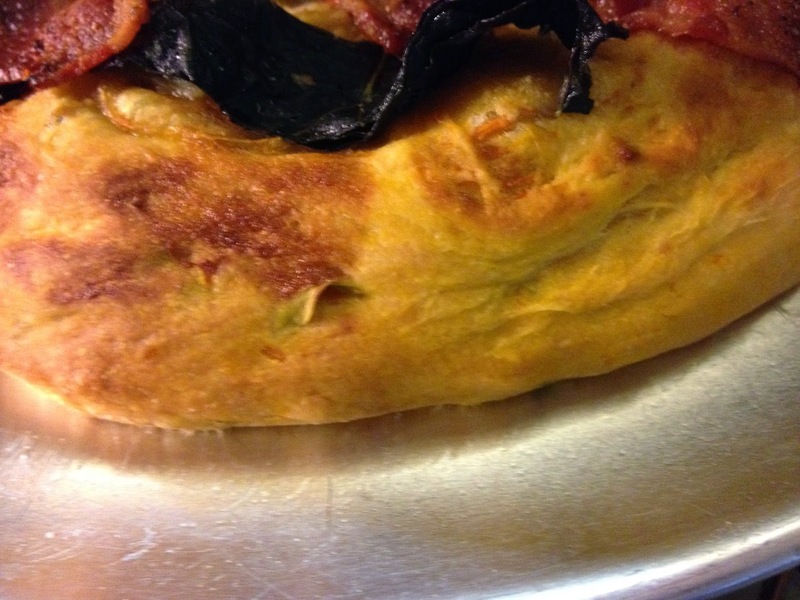 This pizza looks great, too, some good ways to use squash. 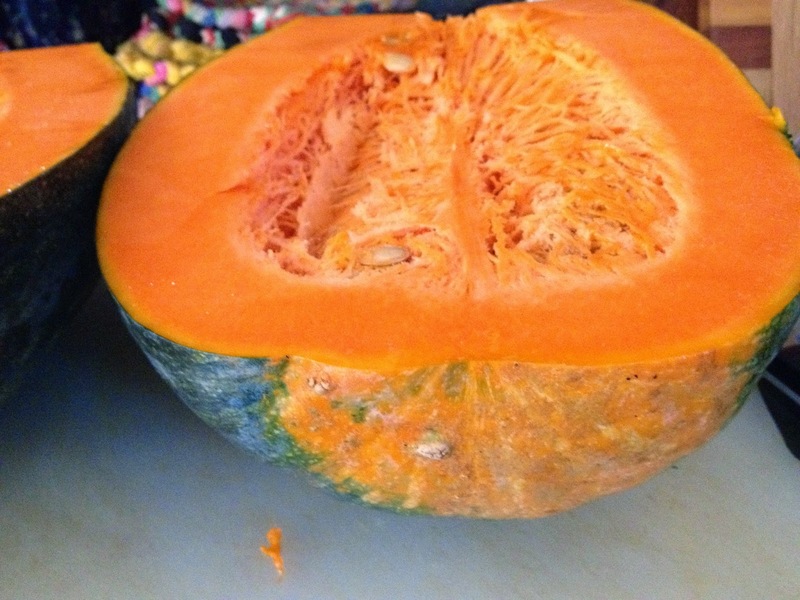 Loved the post and your squash wh looks chock-full of both betacarotene and flavor. We used some of the cheese pumpkins that the compost heap awarded us with last fall for pumpkin brûlée pie last Thanksgiving, and I have roasted and drained the very last one, wh survived on the dining room table all year, to make another one this year. Your squash looks like it would be a supremely pumpkin-y pie!